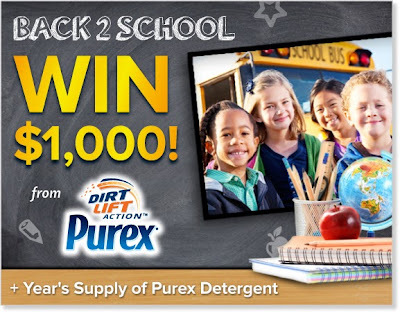 Enter the Purex Back To School Giveaway Sweepstakes! 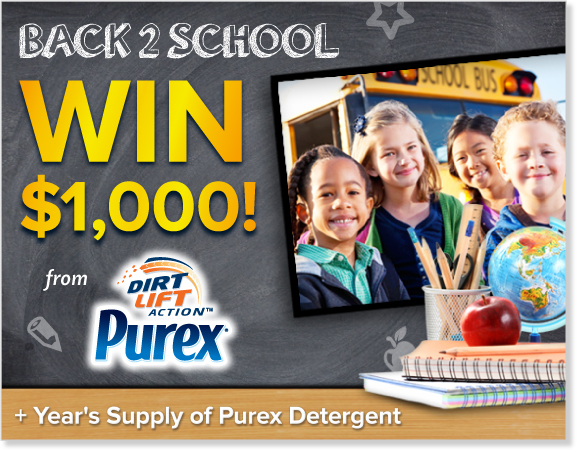 Enter to win a year supply of Purex! You'll also get a chance to win $1,000! This is a great way to win the money to buy everything any student, any age will need for going back to school. Children entering college and even Kindergarten all need a variety of things. Just to name one off the top of my head: Clothing. The list is endless when putting children back into school. Every grade requires something different, new and even expensive. Some require tuition! Be sure to share this with you friends, family, school teachers and even other parents. It's well worth every second to fill out one really short form. They keep your information safe and never give it away! Brought to you by the Purex Insiders! By becoming a Purex Insider, you get all the great benefits of trying out the latest products! See what else you'll get to be a part of just by clicking on the link and checking it out!